The CB version is also available for mid to high handicap golfers, offering added forgiveness but still providing you the spin and stopping power of the Rotex design. The 588 CB is also popular among lower handicap players as well. Rotex is Cleveland’s title for their milled pattern of grooves in different directions, providing spin on longer shots where the impact zone is near the toe. The Titleist spin milled grooving hasn’t been as successful, while Cleveland has been getting praise from a wide range of golfers. 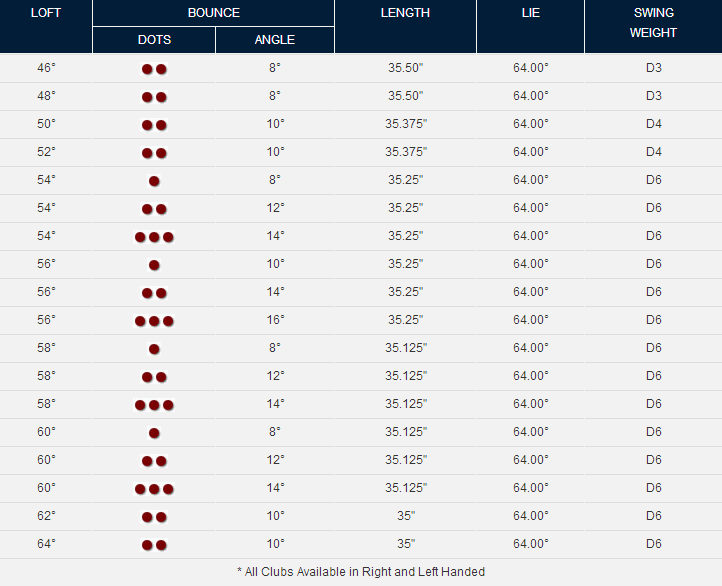 One of the main things to pay attention to when purchasing this club is how much “bounce” you want. For those unfamiliar, “Bounce” is the width of flange on the bottom of the club. If you play a lot of golf in the south and are used to tight lies, less bounce is more likely the way to go. It is much easier to pinch the ball off a tight lie with less bounce. If you play a lot of golf up north then more bounce will more likely act like your friend. Cleveland offers several different bounce and lot options for the 588 RTX wedges.